FC Halifax Town surrendered an early lead at Guiseley as they were defeated 2-1 in their West Yorkshire derby at Nethermoor. It’s still only one win for Town this season; the Shaymen can take encouragement from a blistering start but not from their lowly league position and a defeat against their near neighbours, who now have bragging rights until they meet again at The Shay. There’ll be more frustration that they ended up with nothing after making a superb start to the game. The excellent CJ Hamilton gave Halifax a thoroughly deserved lead; that’s three goals already for the Sheffield United loanee; Town fans will be hoping Nigel Adkins isn’t taking note. But Guiseley battled back, going in level at the break through Will Hatfield’s smart finish before Liam Dickinson’s penalty sealed the comeback late on. The match was a reverse of Town’s form so far this season as they began a hard-fought contest on the front foot, but gradually saw control of the game wrestled from their grasp. Five points from a possible 30 represents a very poor start by anyone’s standards, with Town, like most games this season, impressing in spells without maintaining it for the full 90 minutes. Hamilton picked up where he left off from Saturday with a couple of bursts forward using his searing pace; you could almost sense the fear in the Guiseley defence when the youngster got up to full speed. From his cross, David Brooks miscued his shot in a good position before the ball was recycled and Scott McManus headed over. Hamilton then saw a shot blocked by a superb last-ditch intervention, but the warning signs were there. Another electrifying burst of pace saw Hamilton race into the area before he jinked past Rob Atkinson, one of four ex-Town players in the Guiseley side, and smashed a shot past Steve Drench. Finally, Town had scored first in a game. Where had starts like this been so far this season? Town looked like a different team from the one that started against Kidderminster and more like the one that finished on Saturday. Hamilton was a constant threat, Jake Hibbs and Brooks were busy in midfield, even debutant Julian Banton, playing in a back-three, made an impressive start with a marauding run up-field leading a counter-attack that culminated in Jordan Burrow firing just wide. Hibbs’s shot from 25 yards flew just wide, Brooks’ fired straight at Drench; it was pretty relentless stuff. Guiseley should have hit back when Tom Craddock, scorer of a 96th minute equaliser on Saturday, did brilliantly to set-up Hatfield, another of the ex-Halifax brigade, but he prodded wide from six yards out. It turned out that was a warning too though, as, almost inevitably, the former Town midfielder stroked the ball past Matt Glennon after a superb one-two with Danny Boshell. It was a goal Guiseley arguably didn’t deserve on the balance of play, but Town were perhaps punished for their profligacy in front of goal and not adding to Hamilton’s early opener. Most superlatives were starting to seem inadequate for Hamilton as half-time approached as he nutmegged one of the beleaguered Guiseley defenders before sprinting into the box, although Burrow fired off target from his cross. Although his subsequent cross went straight to Drench, a ‘here we go again’ type of groan from a few Guiseley fans could be heard when Hamilton stretched to keep a long ball in play and set off on another burst forward. 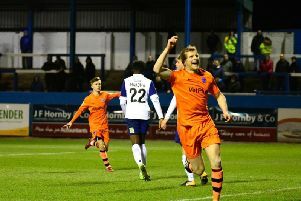 That came just before referee Ian Hussin, who had sent-off two players in his three National League games in charge so far, resisted the calls of half the Guiseley team to dish out the same punishment to James Bolton, who had already been booked prior to a clumsy challenge on the halfway line. Neil Aspin has had to react at half-time on more than one occasion this season with at least one substitution, but no such measure was required here. However, it was a quieter second-half in terms of goalmouth action, and a more even contest, with Jake Lawlor sending a shot crashing narrowly over after meeting Ryan Toulson’s deep cross. Hamilton was finding it more difficult to get on the ball, which was presumably the main thrust of Mark Bower’s half-time team-talk, while Craddock was lurking dangerously around the Town box whenever the hosts pressed forward until he was taken off. There was certainly a more cagey nature about the second 45, with the prospect of a third goal looking increasingly decisive as the clock ticked down. Both sides had lost their way since their best spells in the game, Town for the first half-an-hour, and Guiseley at the start of the second-half, with chances being squeezed out of the match to the point where none were forthcoming. But the curse of the former player nearly struck twice when Danny Lowe’s header was cleared off the line by Kingsley James after Hatfield’s shot was deflected behind. Chances remained intermittent until a rash sliding challenge by Matty Brown correctly gave Guiseley a penalty, which Dickinson hammered into the bottom right corner. Guiseley: Drench, Toulson, Lowe, R Atkinson, Parker, D Boshell (N Boshell 84), Hatfield, Lawlor, Thompson (Brooksby 46), Dickinson, Craddock (Boyes 68). Subs not used: Lockwood, D Atkinson. Halifax: Glennon, Roberts (Macdonald 64), Bolton, Banton, Brown, McManus,, James (Hughes 84), Brooks, Hibbs, Hamilton, Burrow. Subs not used: Porter, Bencherif, Racchi.